Posted January 2nd, 2018 by Jay Mark & filed under Book Reviews. Until it closed for good in 2007, the Buckhorn Baths and Wildlife Museum in East Mesa was one of the Valley’s and Arizona’s most popular and famous resorts. With the serendipitous discovery of hot, mineral-laden water in 1939, the Buckhorn—situated out on the open desert seven miles from Mesa along Main Street—was the first in the Valley to open a health spa. Over the next six decades, it grew into a popular haven for some of the biggest names in baseball and populated the place each spring training season with Hollywood celebrities and other notables. Along with the opportunity to rub shoulders with glitterati, guests and tourists could tour the wildlife museum. Buckhorn owner Ted Sliger, who taxidermied each specimen, claimed the museum featured more than 450 pieces representing the most complete collection of Arizona wildlife. The story of the empire Ted and Alice Sliger created is one of Arizona’s most engaging. With the death of Ted in 1984 and Alice 26 years later, the once icon of roadside business and architecture declined. Recent sale of the property has left the future of the Buckhorn uncertain. That’s why historian Jay Mark, who has contributed antiques-related articles to The Antique Register since 2004, collaborated with noted preservation architect Ronald L. Peters to create a book documenting the history of the Buckhorn. The result is the just published Buckhorn Mineral Baths and Wildlife Museum, an Arcadia Publishing Images of America book, featuring 128 pages with 212 images. On Saturday, January 20, from 1 to 3 p.m., Jay and Ron will give a slide show presentation, “From Fire to Empire – The Buckhorn Baths Story,” plus sign their book and greet readers at the Gilbert San Tan Village Barnes & Noble at 2150 East Williams Field Road. The authors have announced all proceeds from the sale of the book will be contributed to the non-profit Mesa Preservation Foundation, long an advocate for saving the Buckhorn and other historic properties and signs from the colorful era of roadside neon. The new publication is now available wherever books are sold; ISBN 9781467126960. 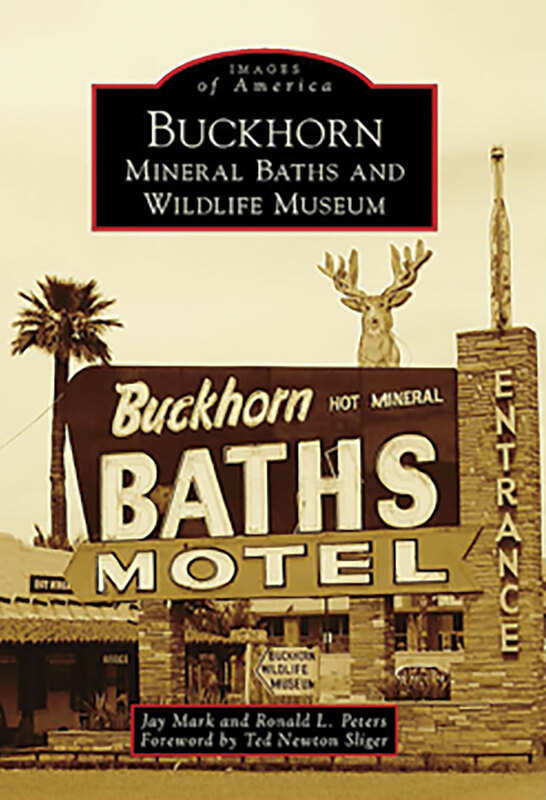 A lucky reader will win a copy of Buckhorn Mineral Baths and Wildlife Museum! by Jay Mark and Ronald L. Peters. Send an email to antique@barlomedia.com and put Buckhorn in the subject line. Be sure to include your name, address and phone number. You can also send a note or postcard to: The Antique Register, 515 E Carefree Hwy, #1128, Phoenix, AZ 85085. The drawing will be held on February 1 and the winner will be sent a copy of the book and be announced in the March-April issue of The Antique Register. Hello, I am the director of the Superstition Mountain Museum. We are setting up our 2019 lecture schedule, which is held January through April at the museum. We would love to have Jay Mark come and speak regarding the Buckhorn Baths. Please contact me at the above email if you are interested for more details. Thank you!